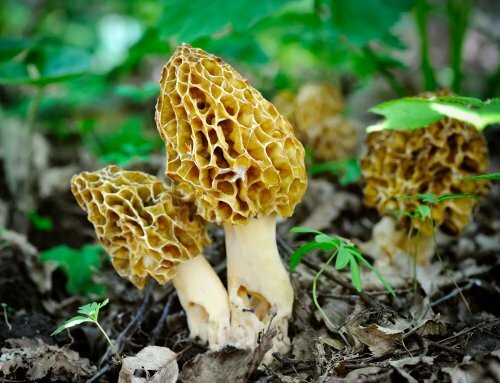 Every August the Iowa DNR Enforcement and Wildlife Bureau conducts the Upland Roadside Survey. The survey generates data from approximately 215, 30-mile routes on pheasants, quail, gray partridge, cottontail rabbits, and white-tailed jackrabbits. Counts are conducted on cool mornings with sunshine, heavy dew, and no wind. These conditions yield the most consistent and accurate results. 2017 and 2018 comparisons are based on routes that are directly comparable between years. Long-term trends are based on all routes completed. 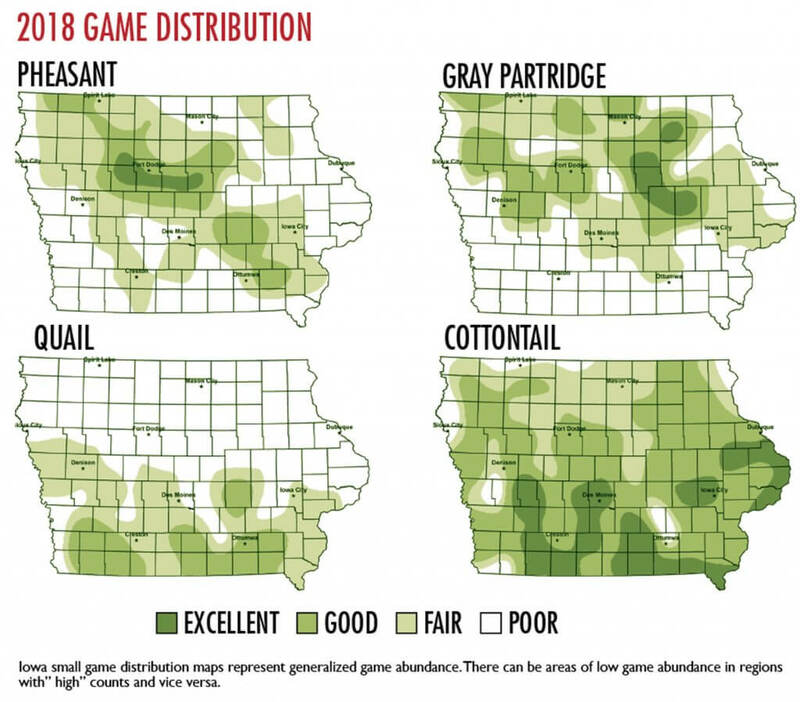 The two factors that determine the abundance and distribution of upland game population in Iowa are weather and habitat. Statewide, Iowa saw an average winter and a drier and colder than normal spring in 2018. Iowa’s weather model predicted pheasant numbers would remain stable and perhaps increase. This prediction was confirmed by roadside counts which showed pheasant (39%) and quail (25%) both increased significantly compared to 2017. Good quail numbers are being reported across their range, while pheasant brood sightings are up statewide. Dew conditions were very good across most of the state this year, so some of the reported increase is likely due to improved counting conditions compared to the poor conditions last year. Both pheasant and quail numbers are expected to be similar to or better than 2017. 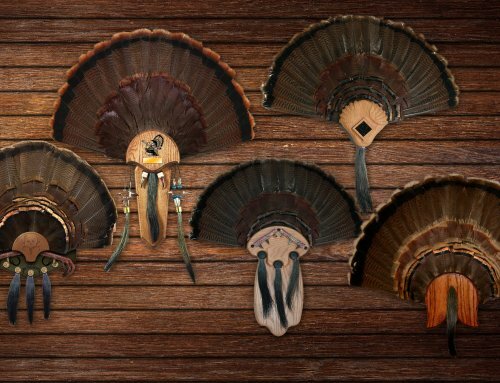 Bird hunters reported good success last year and with 2018 pheasant and quail numbers 45% and 62% above their respective 10-year averages, hunters should enjoy good success this coming fall. Iowa pheasant numbers increase with mild winters (less than 19 inches snowfall) followed by warm, dry springs (less than 6 inches rainfall), and decline with snowy winters (30+ inches snowfall) followed by cold, wet springs (8+ inches rainfall), and remain generally stable with average weather conditions, winters with 20–30 inches of snow and springs with 6–8 inches of rainfall. The 2017–18 winter statewide snowfall was 27.2 inches, or 2 inches above the long term mean. Snowfall varied greatly across the state with NW, NC and EC regions reporting 30-40 inches, NE, WC, and Central regions reporting near average and southern regions reporting winter snowfall totals well below normal. Overwinter hen survival for pheasant and quail should have been average to above average in most central and southern regions and near to below normal in the NW, NC and EC regions. Reproductive potential coming into spring was likely good in most regions, but likely below normal in NW, NC and EC regions. The spring of 2018 was a roller-coaster for Iowa. It started cold with 10-20 inches of April snowfall in NW and NC Iowa and then switched to one of the warmest by the end of May. Rainfall was well below normal in April and normal in May. The state climatologist noted April was the coldest in state history, but also the 16th driest in 146 years of record, while May was one of the warmest in state history. The last time Iowa had a spring this dry was 18 years ago. In Southern regions lack of snow and dry conditions likely led to earlier nesting, while nesting in central and northern regions was average or delayed. Northern and Central regions also saw significant rainfall in June, while not included in Iowa’s weather model, particularly heavy rains in NW and NC Iowa likely flooded some nests. First reports of pheasant broods in 2018 were May 16th in SE Iowa. In summary, the weather of 2017–18 was all over the board depending on your location. 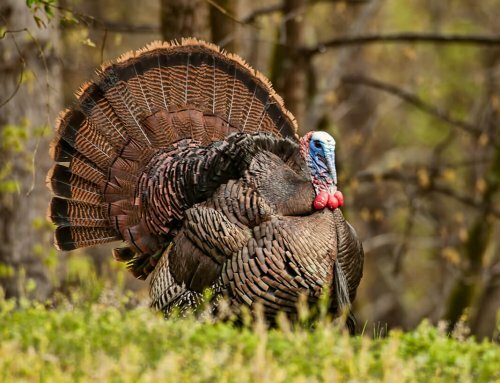 Winter conditions were favorable for good survival in central and southern regions, while nesting season conditions were less than favorable in the northern third of Iowa. The weather data suggested stable to declining population in NW and NC regions and stable to increasing populations in the remainder of the state. Input of statewide weather data into Iowa’s weather model suggested an overall increase in the statewide pheasant population this year compared to last. Changes in habitat are more gradual and the influence of habitat changes on upland populations are only evident after looking at several years of surveys. Information from the USDA shows that between 1990 and 2015 Iowa lost 2,984 square miles of potential pheasant habitat. This habitat was a mix of small grains, hay land, and Conservation Reserve Program (CRP) acres. To put this loss in perspective, 2,984 mi2 is a strip of habitat 10 miles wide that would stretch from Omaha to Davenport. CRP has become critical for Iowa pheasant populations with the loss of small grains and hay lands to corn and soybean production. The August roadside survey yields the most consistent results when surveys are completed on mornings with heavy dew, no wind, and sunny skies. Research by Dr. Klonglan at Iowa State University in the 1950s showed the number of pheasants counted on mornings with medium dew averaged third less than when run on a morning with heavy dew. Heavy dew conditions require good soil moisture in late July and early August. Fortunately Iowa saw much better survey conditions this year with adequate soil moisture and timely rainfall. During this year’s survey 82% of routes were started with a heavy dew verses 71% in 2017. Staff reported more foggy mornings in 2018 and warmer start temperatures compared to 2017. The US drought monitor showed parts of SC and SE Iowa were experiencing persistent drought conditions thru most of the summer, but timely rains prior to and during the survey helped with dew conditions in those regions. Statewide: This year the statewide index is 20.6 birds/route, and is significantly higher than the 2017 estimate of 14.9 birds/route. This year’s statewide pheasant population index is 45% above the 10-year trend, but remains below the long term average. All regions reported significantly higher pheasant populations, except the NW, NC and EC regions where counts were stable or up slightly, but were not statistically significant, meaning some routes increased, while others decreased in those regions. Iowa research indicates overwinter hen survival, brood survival, and nest success are the major factors influencing annual changes in pheasant numbers. Statewide, the total hens (29%) and roosters (34%) counted on routes this year were significantly higher than 2017, suggesting good overwinter survival in most regions. Statewide data on chicks/brood (measure of chick survival) and age ratios (chicks per adult hen – measure of overall hen success) increased 5% and 14% respectively and were statistically higher than last year, suggesting, from a statewide perspective, nest success and chick survival were improved over 2017. 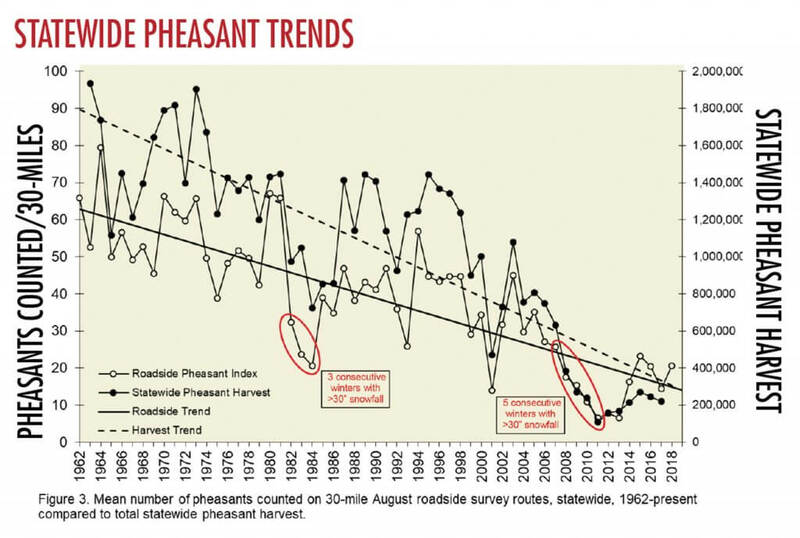 Last year the survey indicated pheasant (-30%) and quail (-23%) populations were down, but total pheasant harvest only declined 10%, while quail harvest increased 11%. Based on reported hunter harvest bird numbers were not down as much as the 2017 roadside survey indicated, suggesting poor dew conditions during last year’s drought did impact the count. So it’s likely some of the increases reported in 2018 are a bit inflated due to the error in 2017 counts. 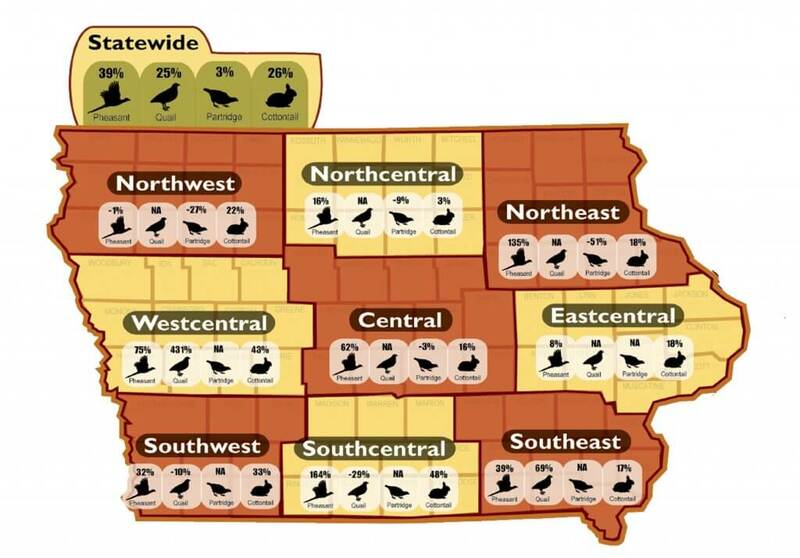 Given this year’s statewide index of 21 birds per route Iowa pheasant hunters should harvest approximately 250,000 to 300,000 roosters this fall. Northern Regions: Counts in the NW and NC regions were unchanged from last year, but increased significantly in the NE region. Counts in NW and NC were at their 10-year averages, while counts in the NE are well above the 10-year average. Total pheasants, hens, and chicks in NW and NC were unchanged from last year and likely reflect the late spring and above normal snowfall in those regions. The NE region had a normal winter and counts bounced up, but remain well below the historic average. The NW region averaged 26 birds per route the second highest of any region. Parts of NW and NC Iowa should offer good pheasant hunting, particularly around public and private lands with good winter habitat. Better counts in NW came from Clay, Dickinson, Palo Alto, Pocahontas and Osceola counties, while Butler, Franklin, Humboldt and Kossuth reported better numbers in the NC region, and the NE reported fair counts in Fayette and Howard counties. Central Regions: The Central region had the highest counts of any region in the state in 2018 with 38.6 birds/route; counts are 85% above the 10-year average and right at the long term average. Both the WC and C regions reported significant increases in total pheasants, while EC region reported no change in numbers. Reproductive parameters increased significantly in the WC and C regions, but were unchanged in the EC region. Central regions should offer excellent hunting this fall where good quality pheasant habitat exists. The WC region reported better counts in Audubon, Calhoun, Green and Sac counties. 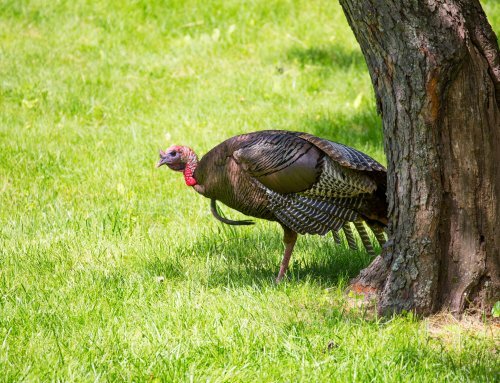 The Central region reported good bird numbers in Boone, Hamilton, Hardin, Poweshiek, Story and Webster, while the EC region reported better numbers in Iowa and Johnson counties. 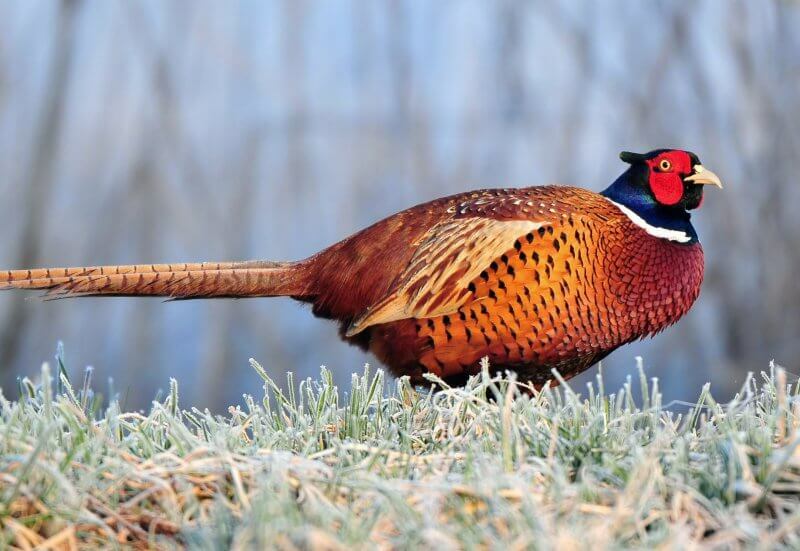 Southern Regions: All three southern regions reported significantly higher total pheasant per route in 2018 compared to 2017. Reproductive parameters, hens with broods, hens and chicks, were significantly improved in the SC and SE regions suggesting a better reproductive season, counts were more variable in the SW region. Counts in all three regions were higher than the 10-year average and counts in the SE were very close to the long term average (Table 4). Some of the better counts in SW came from Adair and Adams counties, while SC reported good numbers in Ringgold, Union and Warren. Hunters in the SE region should have very good hunting in Henry, Jefferson, Keokuk, Mahaska and Washington counties. Iowa’s statewide bobwhite quail index was 1.36 birds/route (Table 3, Figure 4); a significant increase over last year. The statewide quail index is 62% above the 10-year average and right at the long term average. Over the last four years Iowa’s quail index has been the highest seen in the last 20 years. Based on staff and landowners reports quail numbers are at modern era highs for Iowa. The SW and SC regions reported quail numbers similar to last year, while the SE region reported significantly more quail than 2017. Landowners and staff reported numerous calling males this spring, indicative of very good winter survival. The Wildlife Bureau submitted a new continuous CRP SAFE practice targeted to create early successful habitat for bobwhite quail. 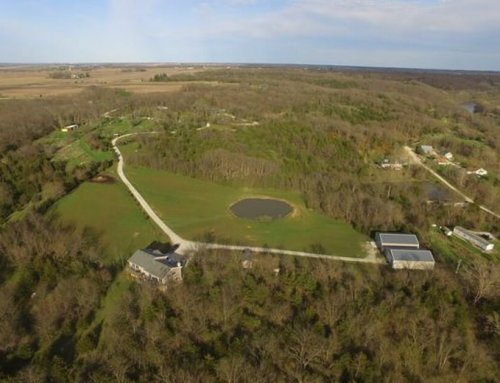 USDA awarded Iowa 40,000 acres for this new practice and all acres were enrolled in April and May of 2017. This new CP38 practice requires 25% of the CRP contract to provide early successful habitat for bobwhite quail. Many of these new CRP fields should provide excellent quail habitat and hunting this fall. The better quail counts in 2018 came from Adams, Appanoose, Cass, Davis, Jefferson, Lucas, Montgomery, Page, Taylor, Wapello, Wayne and Van Buren counties. Given modern agricultural practices and land use, it’s doubtful Iowa’s quail index can get much higher. Anyone who has ever had an interest in quail hunting or hasn’t hunted quail recently – this would be a good fall to go! The 2018 gray partridge count was 2.2 birds per 30 miles and unchanged from last year’s 2.1 birds/route. Counts showed downward trends in the Northern regions and upward trends in the Central regions, but trends were not statistically significant in any region, meaning some routes increased while others decreased in all regions and there was no consistent trend among routes. This year’s statewide estimate is 21% above the 10-year mean and 42% below the long-mean. Gray partridge prefer the wide open agricultural lands of the northern two-thirds of the state. The NC and C regions reported the best densities in 2018. Typically partridge numbers increase following mild winters and when spring/summer precipitation is below normal. Snowier and wetter conditions in northern regions verses central regions likely explain the trends in partridge numbers this year. Better counts in 2018 came from Bremer, Butler, Carroll, Cherokee, Chickasaw, Franklin, Grundy, Kossuth, Sac, Webster and Worth counties. Staff reported an average of 6.8 rabbits per route in 2018, which represents a statistically significant increase (26%) from 2017. Cottontails remain very abundant in Iowa. The cottontail index is 37% and 14% above the 10-year and long-term averages respectively. Regionally, rabbit numbers increased in all regions, but only the increase in the SC region was statistically significantly. Cottontails increase following mild winters with good moisture during spring and summer, thus statewide 2018 was a favorable year for cottontails. Cottontail hunters can expect excellent hunting across most of the state this fall. Highest cottontail densities can be found in the SW, SC, SE and EC regions.